This is a flower that starts with a magic circle so it can be pulled tight. Dc’s and Tr’s are then worked around the ring. It was devised to work in wire although would work in any yarn you like. All the stitches are in UK terms for conversion see here. Thread 10 beads onto the wire. Make a Magic ring by wrapping the wire around your finger. With your hook, pull the yarn through. For an excellent tutorial on how to do a magic ring see the stitchsharers post here. Round 1: 1 ch, 19dc into loop. Ss to 2nd ch of 2 ch. Pull loop tight. Round 2: 3ch, 1tr into next dc placing bead in the final pull through –(yarn around hook, through dc, yarn around hook, pull through dc, yarn around hook pull through 2 loops on hook, pull bead up, yarn around hook, pull through the remaining 2 loops on hook. The bead should be in place.) *1tr into next dc, 1 tr into next dc with bead placed at the top. Repeat from * until all beads used. Ss into 3rd chain of initial 3ch. Cast off. There should be a bead in every other treble around the top. Finishing off: Weave in ends. 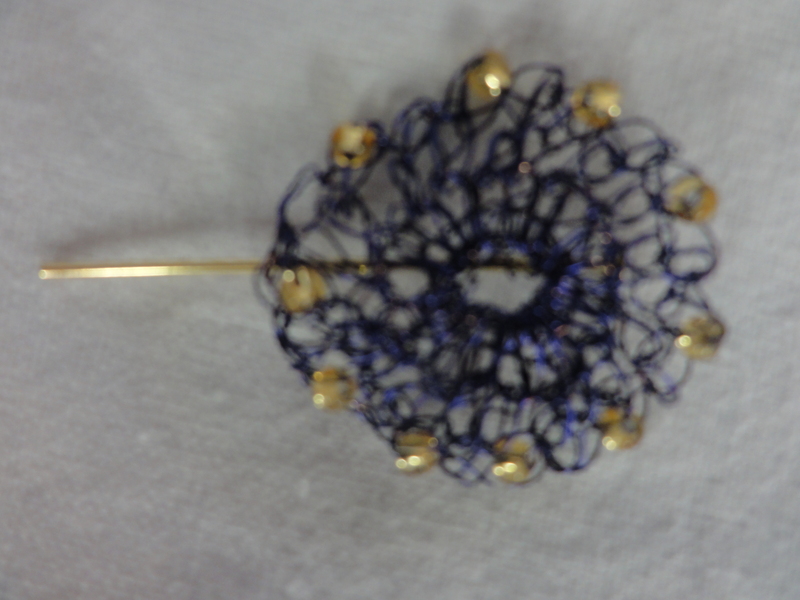 Attach a hair piece or brooch back as desired.